Mike McMeeken, in the England Elite Squad along with Luke Gale. 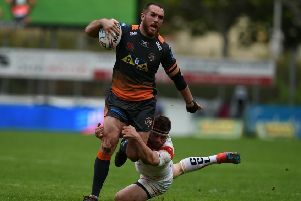 Castleford Tigers duo Luke Gale and Mike McMeeken have been included in a 21-man England Elite Performance Squad that will regularly meet throughout the season with two further team-mates chosen for a new look England Knights squad. While the likes of Paul McShane, Michael Shenton, Greg Eden and Adam Milner can feel unlucky to be left out of the main team, the Knights squad does include outside back Greg Minikin and teenage half-back Jake Trueman. Castleford academy product Daryl Clark, meanwhile, is included in the Elite Performance Squad. The EPS includes a first call up for Wakefield Trinity winger Tom Johnstone and a return to the squad for Leeds Rhinos second rower Stevie Ward and St Helens winger Tommy Makinson. England head coach Wayne Bennett, said: “The Elite Performance Squad sessions in 2017 proved invaluable for the players in the build-up to the World Cup and it’s important that we do all we can to enable them to spend quality time together in an international environment. “The 21-man EPS includes a mixture of experienced international players from the 2017 World Cup Squad, returning players and a new inclusion with Tom Johnstone. “It’s important for us to focus on the Test matches this year but also keep in mind the 2021 World Cup too and the return of the England Knights Performance Squad ensures that we give players valuable time in an international set up. “It is a very positive step for England Rugby League and all 46 players across both squads have the opportunity to impress my coaching staff in the coming months. Also included in the Knights squad is Leeds Rhinos full-back, Jack Walker, who was the youngest player to win a Betfred Super League Grand Final in 2017 and has impressed at full-back for the defending champions this year. Walker is selected alongside team mate and fellow grand finalist Liam Sutcliffe. Wigan Warriors and Hull FC, who recently played the first ever Super League game in Australia, each have five players selected in the Knights Performance squad, including 2017 Betfred Super League Young Player of the Year, Oliver Gildart and 25-year-old Hull FC full back Jamie Shaul. England Knights head coach Paul Anderson said: “The return of England Knights is hugely beneficial for the future of England Rugby League and developing players to a high standard for International Series’ and the 2021 and 2025 Rugby League World Cups.